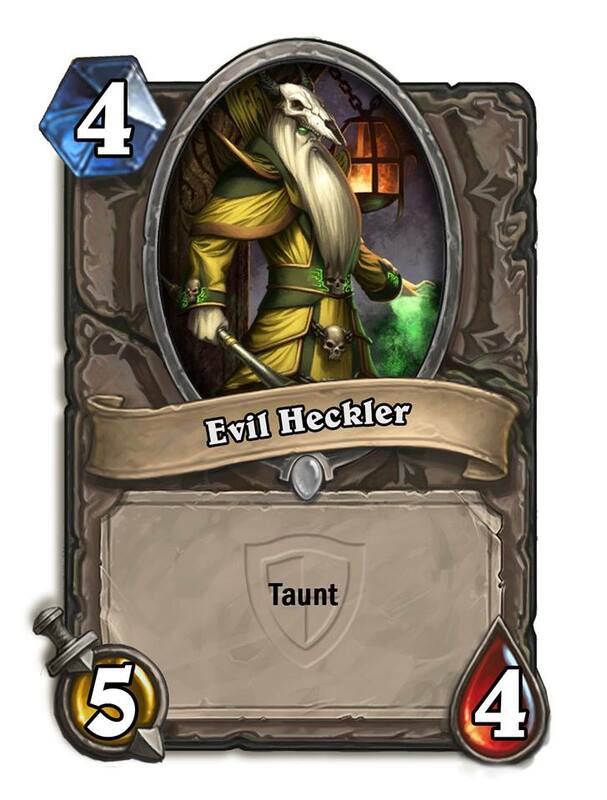 Evil Heckler is a common neutral minion card, from the Grand Tournament set. Evil Heckler can be obtained through The Grand Tournament card packs purchased online from the Battle.net shop, or through crafting. Many consider this card to be a strictly better version of Booty Bay Bodyguard, as it costs one less mana. The main difference is that as a Basic card, Booty Bay Bodyguard is automatically included in all players' collections, while Evil Heckler must be acquired. Alternatively, Booty Bay Bodyguard may be stronger when used in conjunction with cards that depend upon minion cost, such as Effigy, and the Evolve mechanic. Evil Heckler is also from The Grand Tournament set, which is currently only usable in wild format. Sen'jin Shieldmasta's low Attack tends to have give him problems in taking down minions with 5 Health. Evil Heckler can be better in those situations, e.g. he can trade against Sludge Belcher while Sen'jin cannot. Evil Heckler, Barnes, Vulgar Homunculus, Hecklebot, Aluneth and Skull of the Man'ari are currently the only cards in the game to use randomly selected quotes. Any of the stated lines may be used when the minion is summoned. Your mother was a murloc! You smell like a leper gnome! This card's art specifically depicts Dalronn the Controller, as depicted in the World of Warcraft Trading Card Game "Icecrown" series. Dalronn was originally depicted wearing a skull crown, but this was removed before release. This was apparently done due to China's regulations about depicting bones, so that it would not be necessary to provide two different versions of the card art, as they had to with The Skeleton Knight. This card's summon quotes are a reference to a scene in the 1975 comedy film Monty Python and the Holy Grail, where a French soldier heckles King Arthur with the following line: "Your mother was a hamster, and your father smelt of elderberries!" An individual very similar in appearance to the Evil Heckler appears as a minor background character in Forest for the Weary, one of three web comics released prior to the launch of Knights of the Frozen Throne. At the end of the comic, after the Pompous Thespian has finished telling his tale, the heckler states that he is confused about the motivations of the "vampire orc" from the tale and wonders what he got out of the ordeal.